CityRacks are free sidewalk bicycle parking racks, placed throughout New York City by DOT. They to encourage cycling for commuting, short trips and errands. 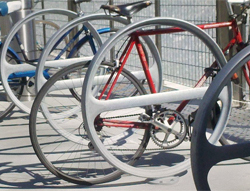 CityRacks accommodate all types of bicycles and locks. CityRacks are not intended to be used for long-term parking. Please note that because of the great interest in this program, DOT cannot provide an individual response for each suggestion. It may take six months or more before new requests can be investigate. Bulk requests from Business Improvement Districts, civic associations or other groups of community members are encouraged and will be prioritized. You can also use a downloadable application to request a CityRack in your neighborhood or at Schools. Please email the application to cityrack@dot.nyc.gov or mail it to the address on the form. Your form was not submitted. Please check to make sure that you filled in all of the required values and try again. If you have any questions, please contact cityrack@dot.nyc.gov.